This epic 12 day Irish tour effortlessly explores more of Ireland than most Irish people will visit in their lifetime. From the Giant’s Causeway in the very northeast to the Blarney Stone in the south-west, the tour is filled with amazing and varied scenery, fantastic walks, great outdoor activity options. Not to mention fascinating historical and legendary sites. This really is a tour of a lifetime. On this incredible Irish adventure, you will experience and learn about both the modern and ancient history of Ireland. This 'Giant Irish Adventure Tour' is made up of our award-winning 8-day tour plus with the added bonus of experiencing Northern Ireland and the rugged north-west coast. 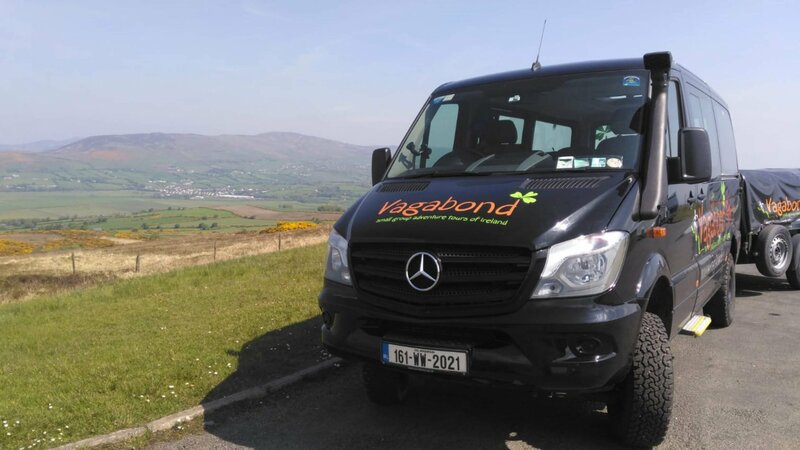 On this Vagabond Tour, you will travel the length of the famous 'Wild Atlantic Way'. Please see below more details on parts of Ireland you will explore. In 2007 Northern Ireland was named as one of the top ten places in the world to visit by Lonely Planet travel guides. Not surprising really when you consider the great scenery, fascinating history and political situation, the activity options, and the genuinely warm welcome. Plus, of course, for many, it is a completely new area to be explored as the peace has unfolded over the last ten years. All the highlights such as Belfast, Derry, The Antrim coastline and the Giant's Causeway are covered – plus plenty of secret places of our own. Fans of the Game of Thrones will be treated to see many of the stunning backdrops from the series, which were shot largely in Northern Ireland. To check out these scene location click here. Heading across to the north-west imagine a country of wild moorland, rugged mountain ranges, and endless unspoiled beaches. Counties Donegal, Sligo and Mayo feature some of Europe's least populated regions – at times we will have the landscape all to ourselves as we walk in the hills of Donegal, explore the megalithic tombs at Carrowkeel or walk along silver strand beach in Mayo. There are of course a few well-known highlights, like Croagh Patrick, Ireland's holiest mountain and plenty of breathtaking lesser known locations. The Western section of the tour weaves its way down the coast from county Mayo into counties Galway and Clare and down towards the mighty River Shannon. Firstly we enter Connemara, a favorite area for Irish people to come on holiday due to the rugged scenery, local friendliness and culture. Continuing south, either through or around Galway city we enter the southerly province of Munster and county Clare to explore the unique landscape of the Burren, enjoy the live traditional Irish music in area and marvel at the Cliffs of Moher. The south-west is the most popular area of Ireland for visitors, and with good reason. We spend four nights in Counties Kerry and Cork exploring the three peninsulas of Dingle, Iveragh (the Ring of Kerry) and Beara. Each has its unique scenery and atmosphere, from the green rolling fields and buzzing town of Dingle, to the majestic mountains of the Ring of Kerry and the remote and unspoiled wilderness of the Beara Peninsula. We take trips to islands, sea-kayak with seals, visit ancient archaeological sites and enjoy first-class Cork and Kerry hospitality before heading inland and back through Limerick and Tipperary to Dublin. Activity:Hikes, kayaking, horse-riding, cycling and boat trips. Plus lots of history and culture. If this sounds too active, then we suggest a Driftwood 11 day tour. Pace Of Tour:12 days of activity, adventure and discovery. This tour requires a good level of fitness. For example, can you hike for 2.5 hours on undulating hill paths? Would you enjoy a 2.5 hour cycle on varying terrain? Estimated US$ guide price: $3,410 USD (based on US$1 = €0.84). Above price is for 2019 tours.